Achieve your goals effortlessly with the "Subliminal Success Accelerator"
Realizing all of Your Dreams! You can do it, in a way that accelerates your power to manifest as effortlessly as "flipping on the switch" to the Law of Attraction. It’s even more than the power of your mind…it’s harnessing the power of your heart, mind, spirit, and the power of the Universe to say YES to you. 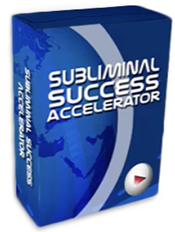 We've created The Subliminal Success Accelerator Package. It's a way to make sure you get every last drop of power from your personal Mind Movie or if you haven't yet completed your own, you can use our Pre Made Mind Movies that are also included. Plus we have included an ongoing support blog and team to make sure you never lose focus and continually move closer to your desires. A "rocket fuel" booster for your Mind Movie--an astounding first of its kind, Mind Movie Subliminal! Over $20,000 of research and development went into this technology. And now YOU will be one of the first to benefit from it. If you're like me, finding the time to fully concentrate and work at the visualizations for the Law of Attraction is almost impossible sometimes. Imagine how it would be, if the power of your Mind Movie could be deeply embedded into your subconscious, every single time you sat down at your computer, no matter what you were doing. Quite simply, it's the easiest, "laziest" way to.. This is EXACTLY what Mind Movies Subliminal does. In the simplest terms, the Mind Movie Subliminal works round the clock to flood the reality of your new life into your mind even more. It works stealthily behind the scenes from the exact script you have created for your life, running almost invisibly behind anything you're doing on your computer. After a few minutes, you won't even be consciously aware of it, but you'll be soaking it up like a sponge. This is powerful beyond measure, and will pull your manifestations to you with lightning speed. A live interactive coaching call hosted by Natalie Ledwell each month with top experts on visualization and the Law of Attraction. The call will be made available for download in Mp3 format after the call, so you can listen to it while you're in the car, working out, or any other time convenient to you. In time you will amass an library of priceless recordings from all of the great teachers on the Law of attraction. Each month you will receive an inspiring Subliminal Mp3 Audio created by the worlds only certified brain entrainment engineer Morry Zelcovitch to continually support your journey to prosperity. This is an awesome sound track laced with millions of positive affirmations with a different theme each month. Access to an interactive Member's Only Blog, where you can connect with like-minded individuals to keep you motivated and on track with your goals. A monthly mini-magazine which includes a great free new bonus every month, an "Ask Natalie" section where you can submit your questions to be answered by Natalie herself, and an accelerator article of the month. You get to test drive the "Subliminal Success Accelerator" for 30 days absolutely free so you can try it, apply it, experience incredible results and if you like it, do nothing, and your subscription will automatically be renewed for the incredibly low price of $37 per month from then on. If for any reason you don't like it, just cancel your subscription, by sending us an email to [email protected] within the 30 days, keep everything you've received and you will never pay a cent. It's as easy as that! No small print! No hassles! everything I want into my life!